Let's go for a trek in the Beşparmak Mountains of western Turkey. This mountain range is in south-western Turkey, near the city of Aydın and fairly close to the ancient city of Ephesus and the modern town of Selçuk. People lived here in prehistoric times, around 6000 BC. A Greek settlement grew up along the lakeshore at its base, starting in the 400s BC. 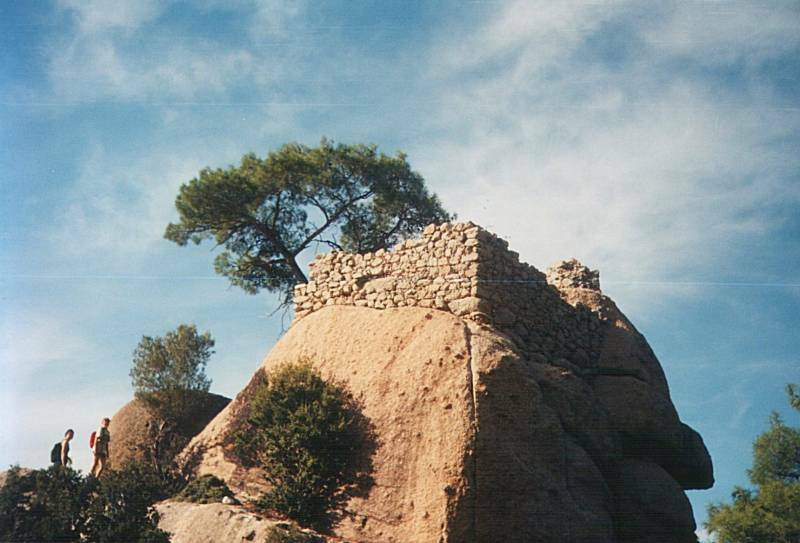 Its ruins can still be seen. The mountain ridges later became a Byzantine monastic center from the 600s through the 1300s AD, and you can trek up into the mountains and find ruins of those monasteries. 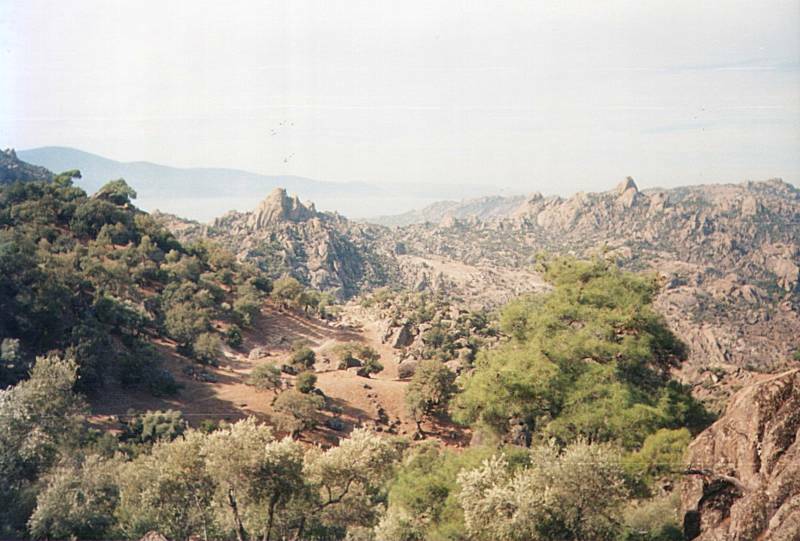 The Beşparmak Mountains form a mountain ridge with several spurs. In Turkish, it's Beşparmak Dağları or the Five-Finger Mountains. Yes, there are at least five major spurs. 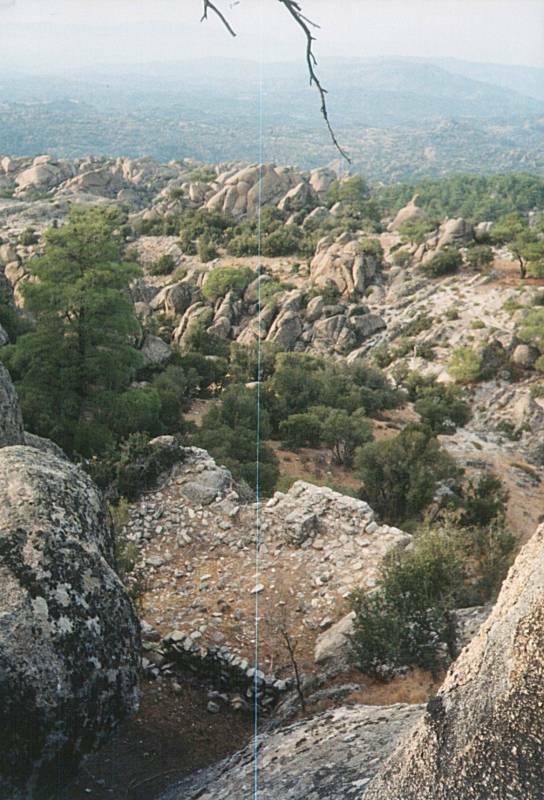 The main peak is labeled on some maps as Beşparmak Dağı, or Five-Finger Mountain. But that name comes from the fact that from above it is shaped somewhat like a hand. There is one highest peak but five (or so) major ridge-like formations radiating out. From above you might say there is one, but from below it looks like five. This is still a geologically active area. Anatolia (the landmass of today's Turkish Republic) and the Aegean sea contain inactive volcanos and experience earthquakes, quite severe at times. 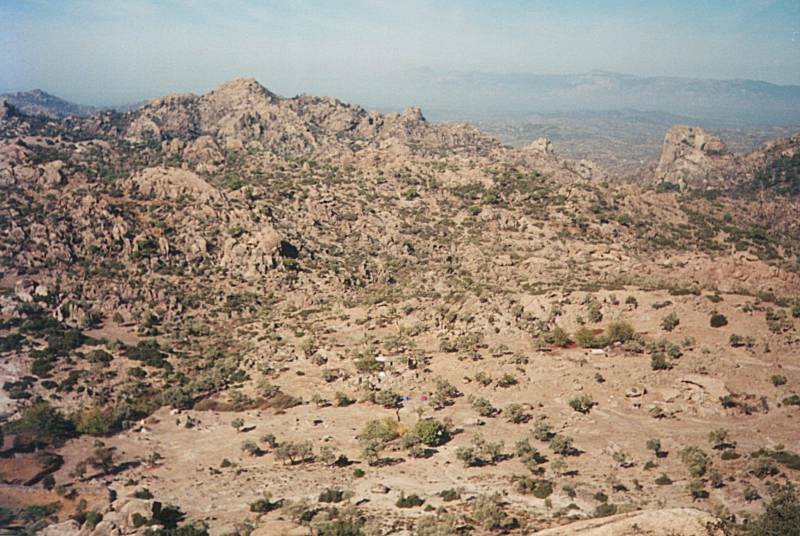 This area of southwestern Turkey is close to the Anatolia boundary between the Anatolian Plate and the Aegean Plate. The terrain is fairly rugged. A river flows through this area into the Aegean, coming down from the east and the region of Denizli, the formations of Pamukkale, and the ancient cities of Hierapolis, Laodicea, and Aphrodisias. This is the great Meander River, or Büyükmenderes Nehri in Turkish. You know that English word meander, don't you? This river's classical Greek name is the source of that word, because it does a lot of twisting back and forth to cover the distance toward the coast. Long ago, this mountain range was on the coastline of a gulf of the Aegean known to the ancient Greeks as the Latmian Gulf. This gulf once extended as far inland of today's city of Aydın. The gulf filled with sediment from the Meander River, forming a nearly flat flood plain just barely above sea level. All the streams, including the Meander River, well, they meander quite a bit as they flow toward the Aegean! Here is a map of the area. 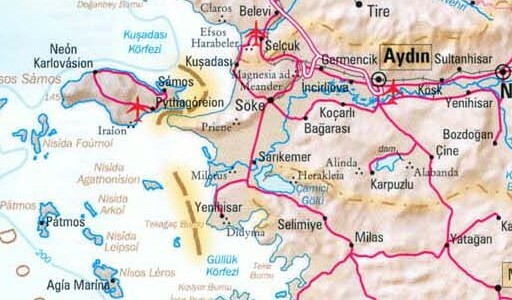 Aydın is the city (the purple blob) at the northeast corner of the map. 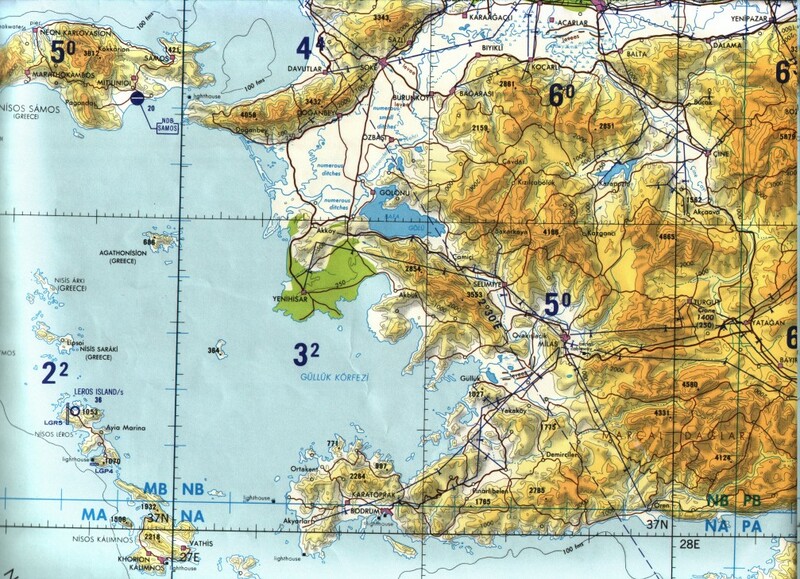 The Greek island of Samos lies just off the Turkish coast at the northwest corner of the map. The broad Meander River valley is the very light yellow band running from east to west along the north edge, then turning southwest to the Aegean. U.S. Government Tactical Pilotage Chart of the Beşparmak area. 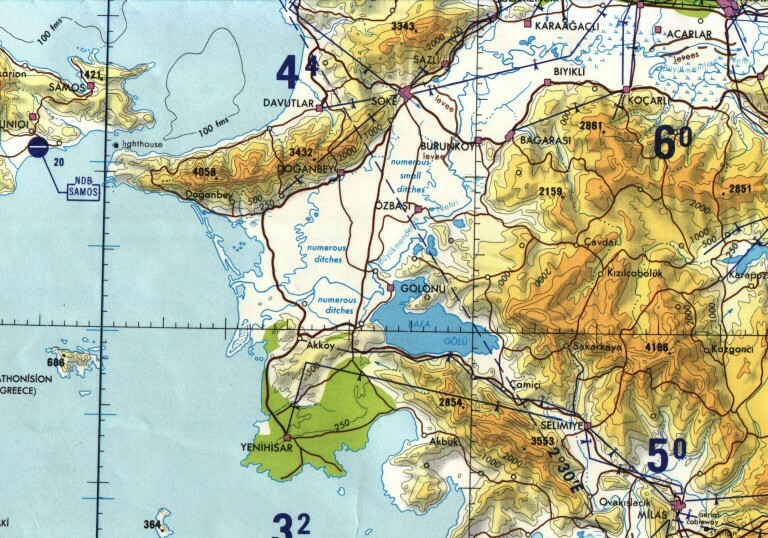 See the lake labeled Bafa Gölü near the center of the above map, along the south edge of the Meander River valley. 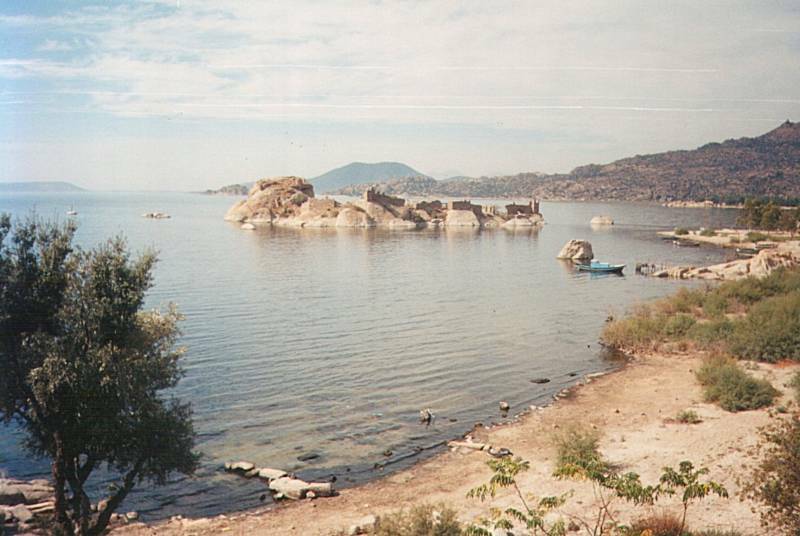 Gölü is Turkish for lake, this is also known as Lake Bafa. Below is a small region of that same map. 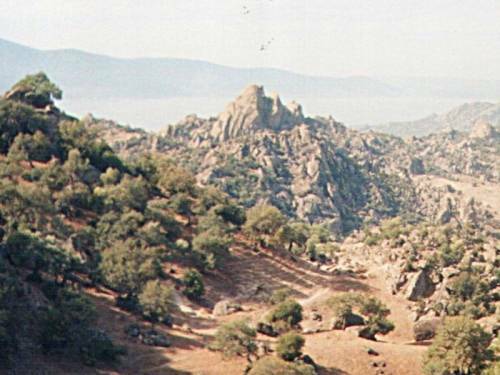 Notice the mountain peak directly east of Bafa Gölü, encircled by mountain roads joining the small villages of Çavdar, Kızılcabolük, Sakarkaya, and an unnamed village. That's the Beşparmak. You can see that there is a central ridge running northwest to southeast, and at least five major ridges radiating out from there. Note that a TPC can be rather generous about what it shows as a road. These roads can be seen from the air, they're useful for navigation on low-level tactical air missions, but they are not necessarily easy driving. Click here if you want a higher resolution version of the TPC. 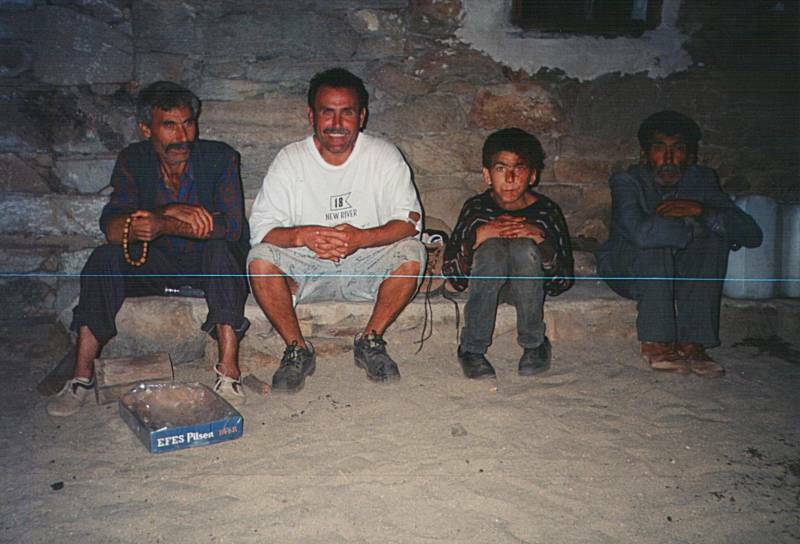 We came in by van to the village of Çavdar, and trekked in from there. We came out near the east end of Bafa Gölü. Here is another U.S. Government map showing a much larger area with far less detail. Notice that this map labels Bafa Gölü as Çamici Gölü. Names change, and there are often multiple names for a place. The ancient Greeks called the mountain range Λάτμος or Latmos, and Strabo reported that it had been called Mount Phthires in the Catalogue of the Trojans, and that the western ridge was called Mount Latmos while the ridge on to the east was called Mount Grium in his time. 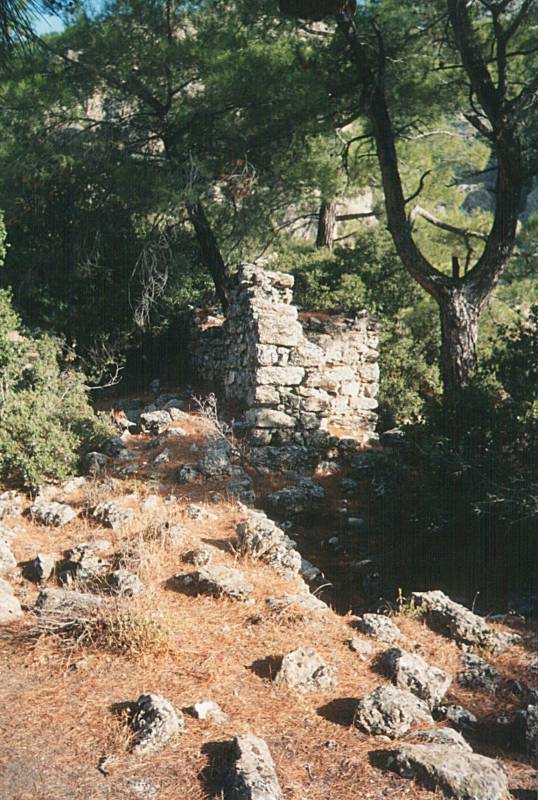 This map shows an ancient ruin named Herakleia at the east end of the lake. This was where we came out and met our van back to Selçuk. On to the trek and the pictures! 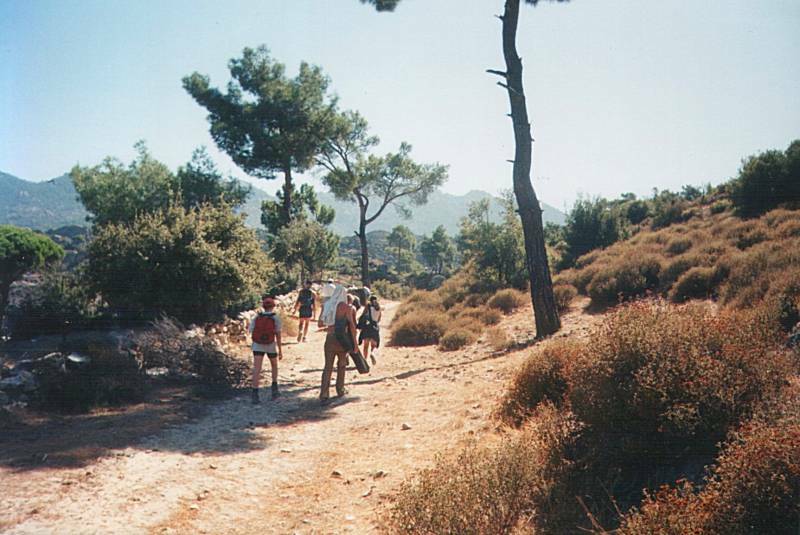 Here we are, starting up the path into the mountains from near the village of Çavdar. We stopped along the way for a water-and-shade break. It's maybe 10 to 15 kilometers from the road to where we're going. The area has a number of warm springs and vapors, showing the region's geological activity. About 170 rock paintings have been discovered in the area, in a site overlooking Lake Bafa. The earliest of these has been dated back to 6000 BC. The archaeologists' report is available in the original German. Right-click on that page within Chrome and ask Google to translate it. This page has some nice pictures of the petroglpyhs. They have been found around small caves and overhangs, mostly springs and streams. They are done in a distinctive style, with the human heads shaped like a flattened "M". 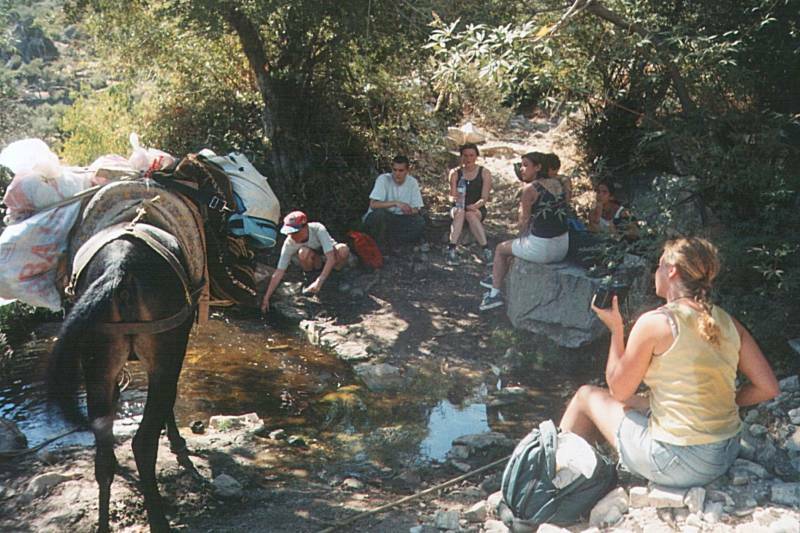 People appear in most of the pictures, sometimes hunting animals and sometimes with other figures. Those Bronze Age people apparently worshipped a dragon, the firey embodiment of a deity living within the mountain. 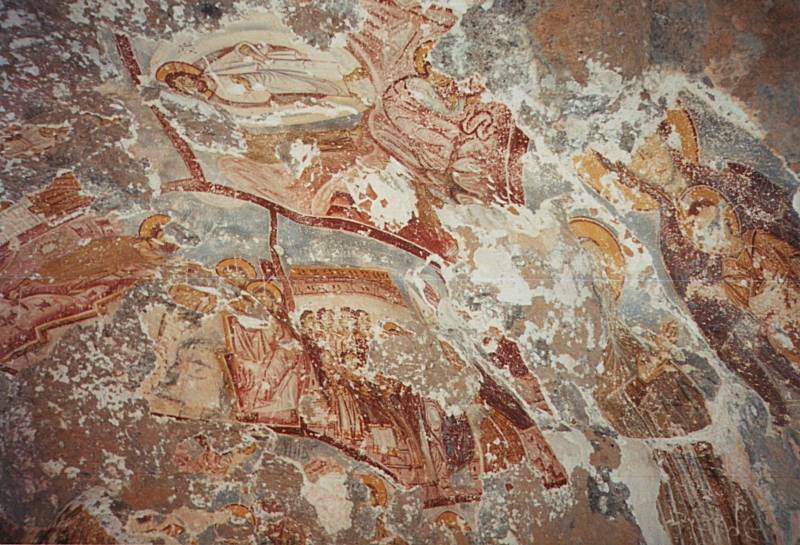 Some of Ancient Greeks coming into the area later may have found these paintings from the earlier inhabitants, and they may have syncretically picked up some of the really old-time religion. We have arrived at our home for the next few days! 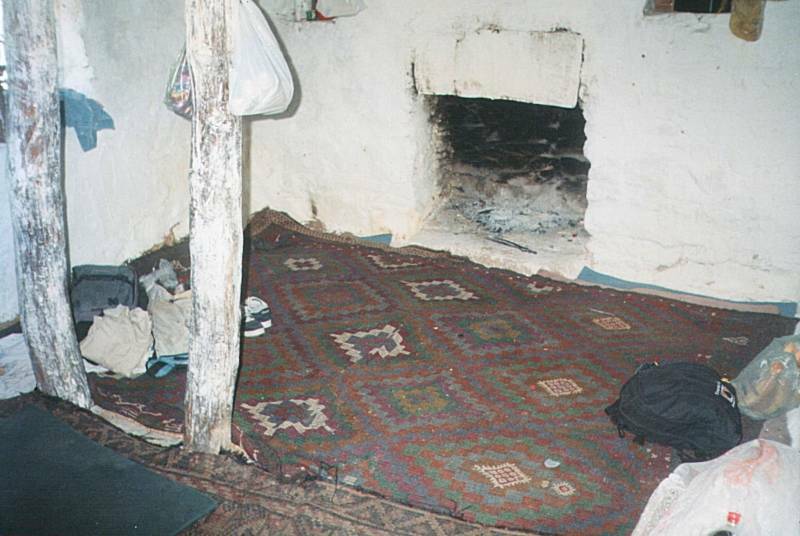 This is a cabin where Mahmet, our guide, has lived while keeping sheep. But he decided that it was much more interesting to lead treks than to be a shepherd. You have your choice — sleep inside, or outside in a tent. We are leaving our camp and continuing up the mountain. The cabin is just below the center, maybe you can see the two brightly colored tents? We have arrived at the monastery ruins! The mountain was known as Λάτρος or Latros during Byzantine times, changing slightly from its earlier name of Λάτμος or Latmos. Tradition holds that it was founded by monks fleeing Sinai during Muslim incursions in the 600s AD. There were three monasteries here in the early 900s and eleven by 1222. It was an active monastic center with influence throughout the Byzantine Empire. The monastery is higher than where we are camped. So it's a little cooler, slightly less dry, and there is some nice shade from evergreen trees. Joseph the Hymnographer was a monk here in the 800s. He was one of the greatest liturgical poets and humn writers of the Eastern Orthodox Church, and his feast day is celebrated on April 4th. He is credited with about 1,000 works, including most of the hymns in the liturgical book Paracletike. He was also an opponent of iconoclasm. Joseph had been born in 810 in Sicily. He fled Sicily after his parents had died and then the Arabs were invading, became a monk in Thessalonica, and ended up here. He died in either 883 or 886. Remember, this is a monastery. The design criteria may seem a little unusual. So what if it's hard to get to a place — it was intended for quiet contemplation. Inaccessability can be a good thing. It's not completely inaccessible, there is a way up with just a bit of scrambling. 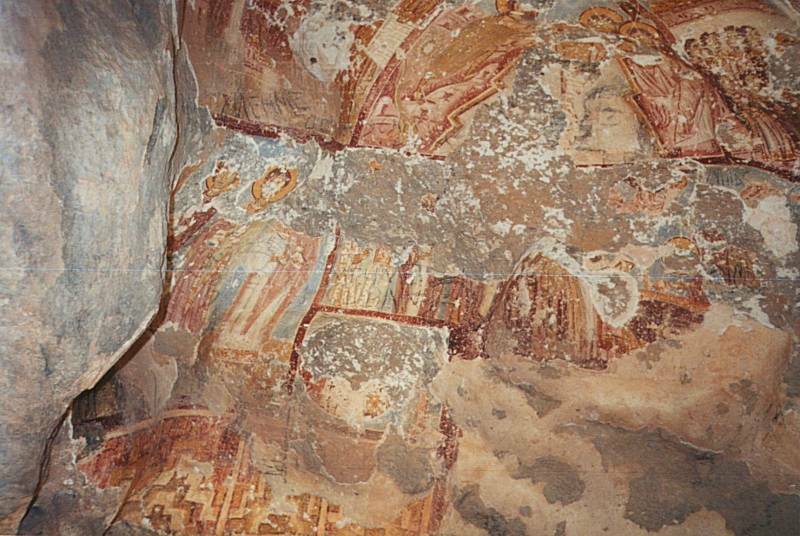 Here are some of the surviving frescos. This monastery operated until around 1100, so these are about 900 years old! The monastic community began declining in the late 1200s beacuse of increasing Turkish military advances into the region, and it was abandoned in the 1300s. Here is another set of frescos. 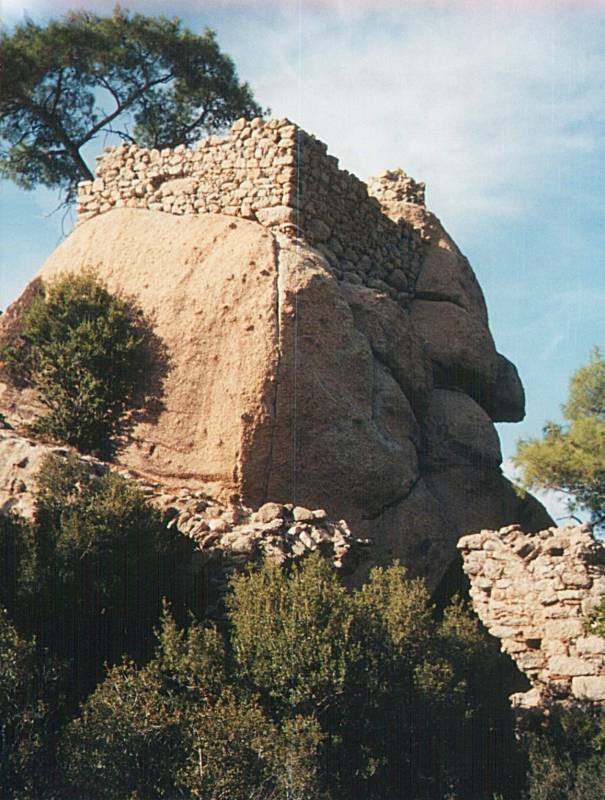 Some monastery structures were built by partially carving them into a cliff face and then building out from there. There are a number of examples where the carved section, complete with its frescos, still survives, while the constructed section is gone. You see what appears to be an alcove of a chapel carved into a cliff face with a long drop below it. Rectangular holes that held the ends of wooden beams are below and beside the alcove. You can see where the other ends of the beams fit into a nearby rock outcropping, and you can imagine the structure that was once like a bridge or balcony. 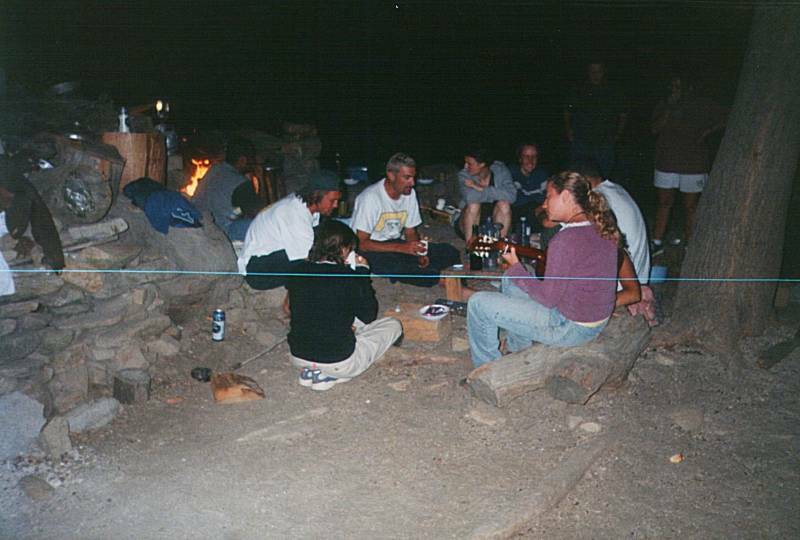 We're hanging out around the campfire after a day of exploration. We needed to bring in our food, a donkey helped with the carrying. 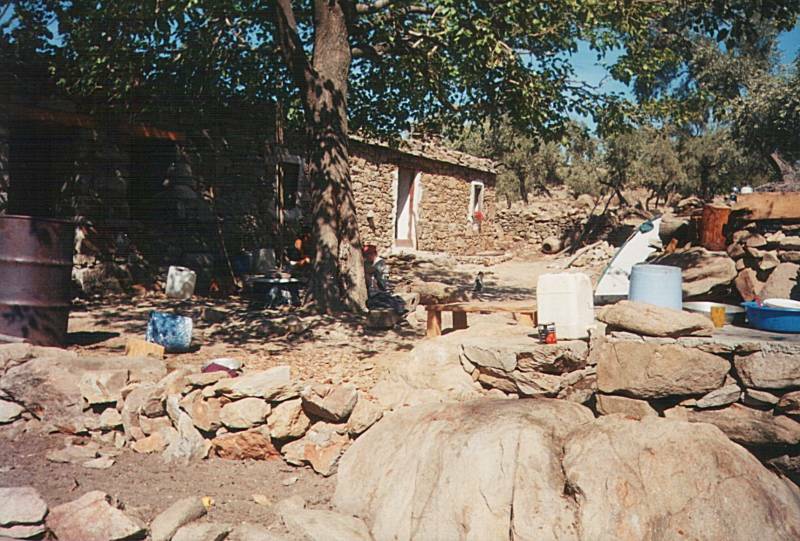 We carried water canteens or bottles for our use on the way in, and then filled large jugs at a nearby spring. 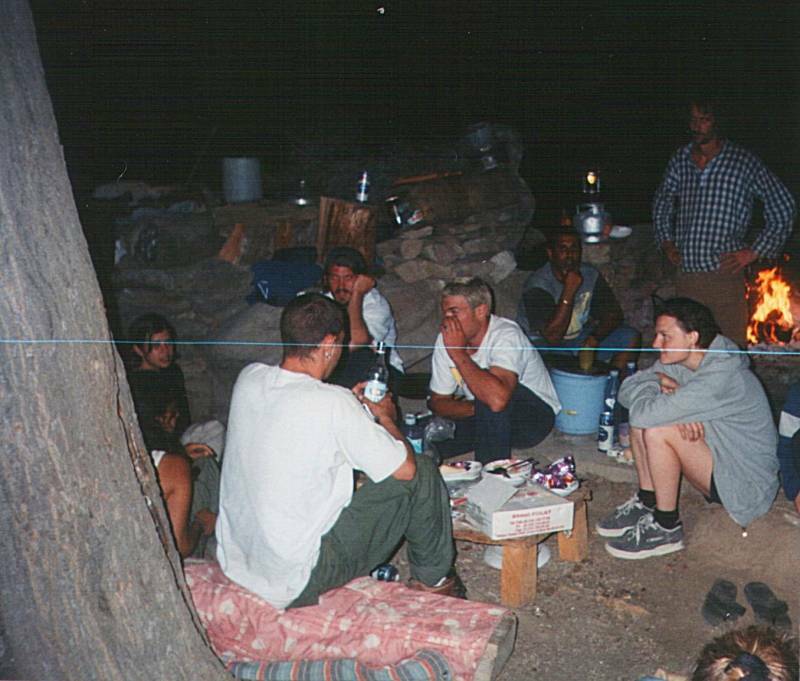 Mahmet and Basley, at center, talk with a couple of the "neighbors" who just strolled 5 km over the mountain in the dark to drop in and say hello. We're on the way out of the mountains, continuing to the south and leaving in a different direction than how we arrived. This is the ruins of the King's Highway or the Royal Road, the Myra-to-Smyrna link of the all-weather trade route between Babylon and Constantinople. Latmus became part of the Delian League in the fifth century BC. It was then captured by the Persian satrap Mausolus during his rule of 377-353 BC. He fortified the city with a wall, to prevent the next would-be conqueror from doing what he had done. The settlement moved a kilometer to the west during the Hellenic Greek times, and took on the new name of Herakleia under Latmos in dedication to the hero Herakles, which we English speakers usually call Hercules. It was built to a more modern rectilinear grid system. By that time the former seaport had been isolated from the sea by sediment. 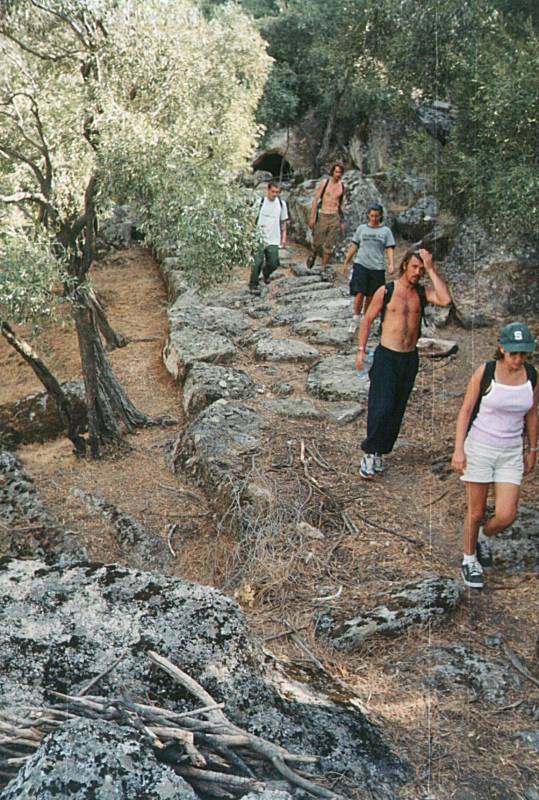 The Royal Road was repaired under Justinian in the early 500s AD when it was already several centuries old. We're getting closer — that's Bafa Gölü in the distance. Bafa Gölü formed behind the marshes of the Meander estuary, and it is still joined to the Aegean by some irrigation canals. It would be fresh water now, but the canals make it somewhat brackish. The lake covers about 7 square kilometers, and it has been made into a bird sanctuary. 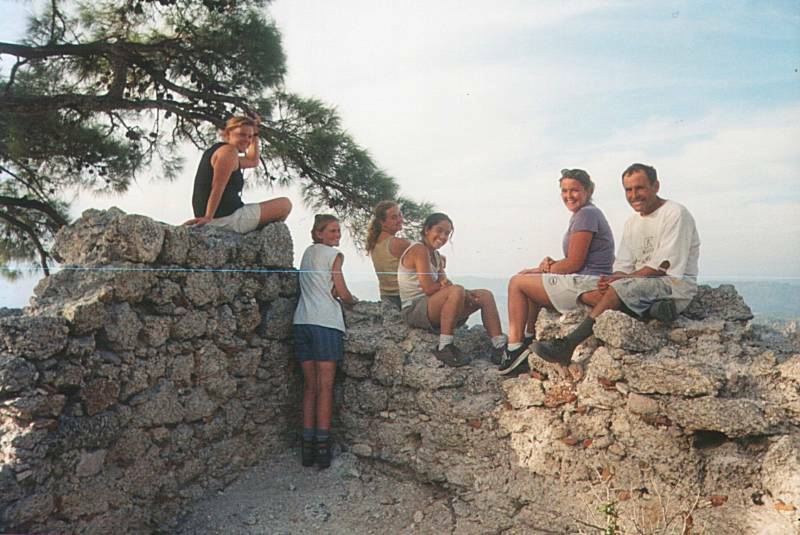 We have reached the shore of Bafa Gölü, where you can visit the ruins of ancient Herakleia. That's another monastery on that small island. 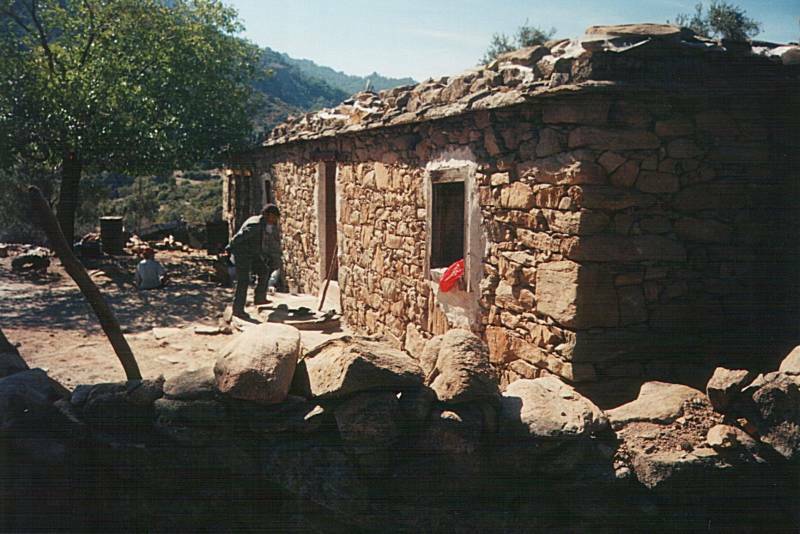 The modern small village of Kapıkırı is built in the middle of the ruins. 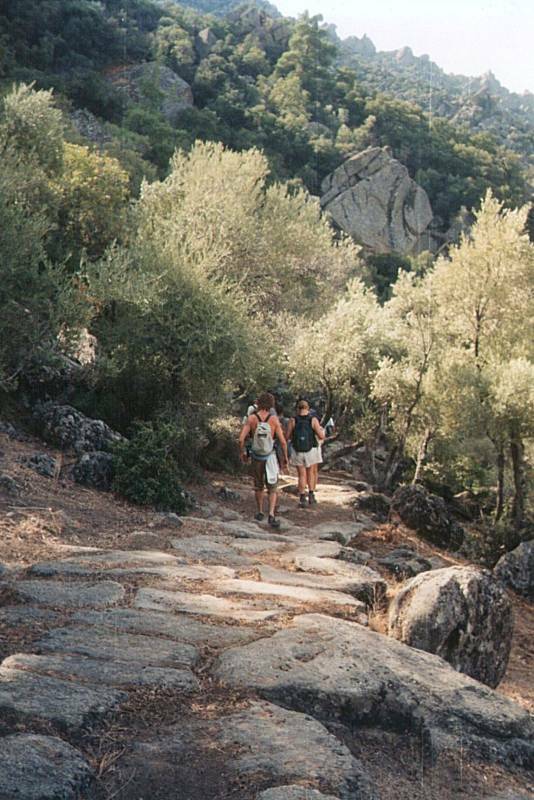 Just to the south, on a small rise, you can see the temenos or Sanctuary of Endymion, originally dating back to pre-Greek times but rebuilt in Hellenistic times. Endymion was a figure in early Greek mythology, a shepherd who loved Selene, the Titan goddess of the moon. Zeus made him sleep forever so he would not age and Selene could look at him every night. The story was that his coffin (he eventually died, it seems) was opened annually and his bones emitted musical tones. People wanted to witness that, so his tomb became a pilgrimage site. He was retroactively declared a Christian saint, despite not even being a monotheist, not really existing, and having supposedly existed long before Christ. Well, he was too prominent a part of the local religious scene to leave alone, so they said he was a mystic Christian saint. 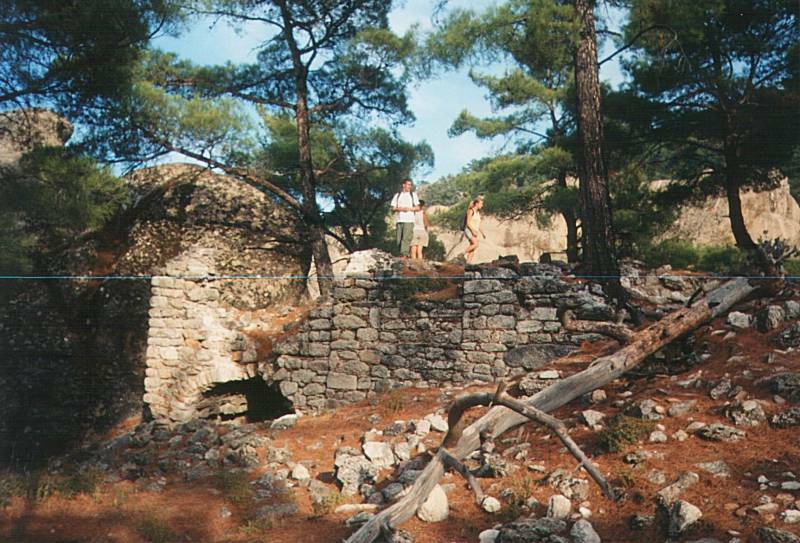 Visit Herakleia, see the musical skeleton. There aren't many pages mentioning this. Some of the few include Eric and Sylvia's site. 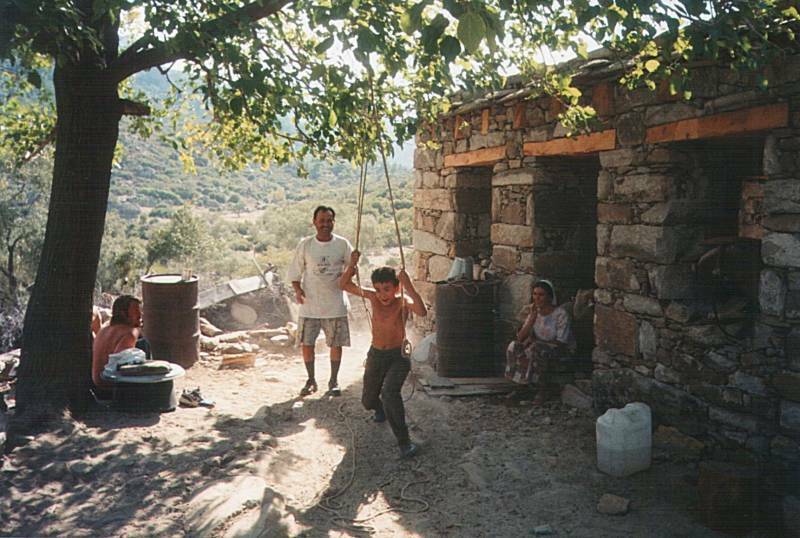 This couple stayed at Bafa Lake, and got some very nice pictures of the ruins. They refer to this as the "Seven Brothers Monastery". It seems that the area has not been studied as much as you might expect. The few archaeologists who have done some exploration seem to agree that the region was probably filled with ruins and only a small percentage are now known to anyone other than the local shepherds.